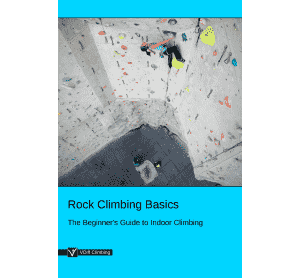 'Top Rope Climbing: How To Belay' is part of the e-book - Rock Climbing Basics: The Beginner's Guide. 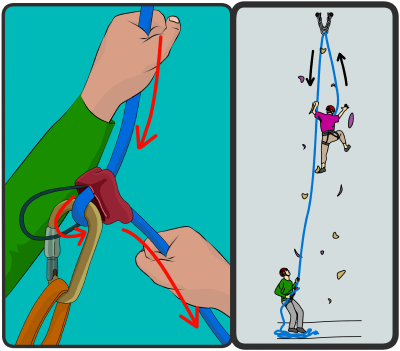 This article explains how to belay for top rope climbing. In most cases, it is very easy to stop a fall once you have mastered the techniques. 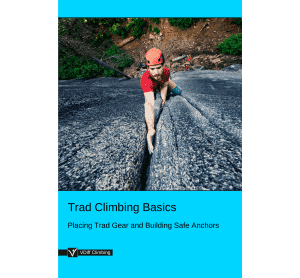 However, it’s important to understand that heavier climbers and thinner ropes make it more difficult. To compensate for this, consider wearing leather belay gloves for extra grip. The angle of separation between the rope strands determines how much friction is produced. More friction makes it easier to hold a fall. Little friction is produced when approaching 0 degrees. It is impossible to hold fall in this position. Some friction is generated as the angle increases to 90 degrees. Depending on the design of your device, this is a good angle for taking in rope. At the maximum angle of 180 degrees, enough friction is generated to control the full force of a fall. 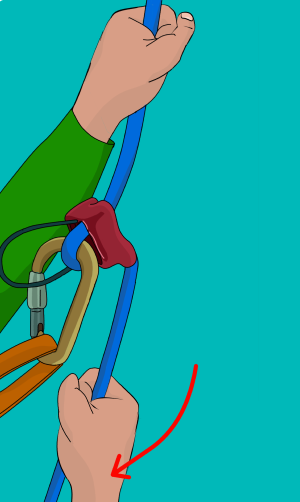 As the climber moves up the wall, you'll need to 'take in' the extra rope that is created. 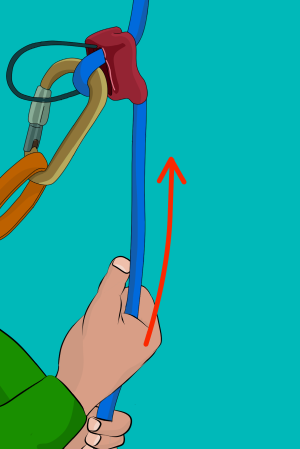 Put your left hand* on the live rope above your belay device, and pull down to take in the slack rope. 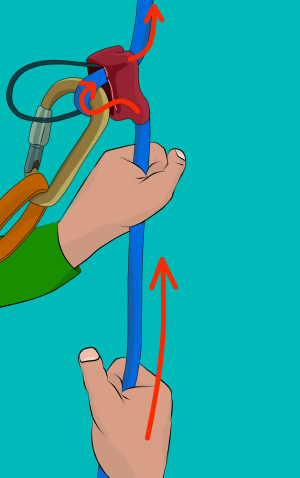 Your right hand should be on the brake rope below your belay device. 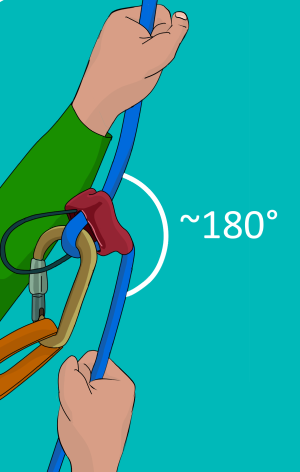 At the same time as your left hand pulls down, move your right hand slightly up, lifting the rope a bit so it's easier to pull through the belay device. *This description assumes that you're right-handed. Feel free to switch right and left hands if it works better for you. Move your right hand back towards you. Make sure you perform these 2 steps quickly. If your climber falls as you're taking in, it's harder to hold them. Your right hand will now be further down the rope towards the ground. 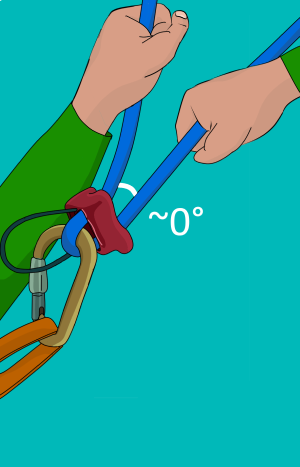 You'll need to move it back up towards your belay device before you take in any more rope. It's important that you do this without letting go of the rope. 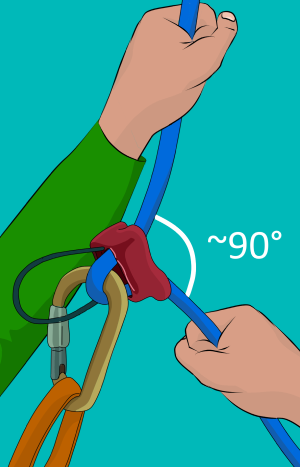 Bring your left hand down and grab the brake rope just below your right hand. 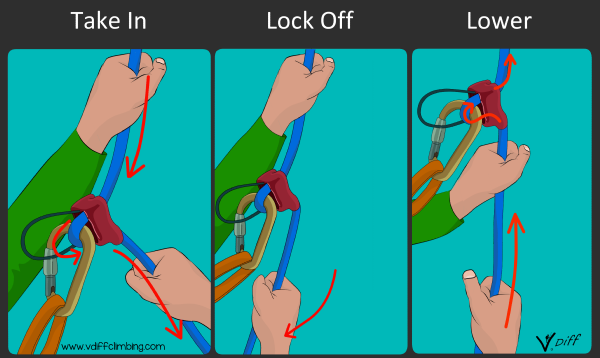 Hold on tight with your left while you slide your right hand back up the rope to just below your belay device. Now you're 're-set' and ready to take in more rope. It's easiest to only take in about 20-30cm of rope at once. 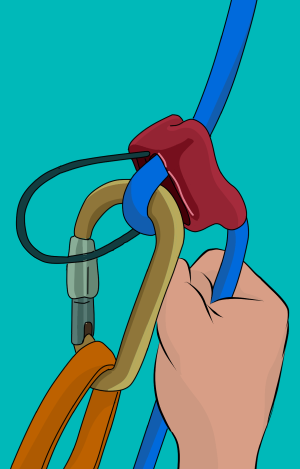 To hold a climber's weight on the rope, you need to 'lock off' the belay device. 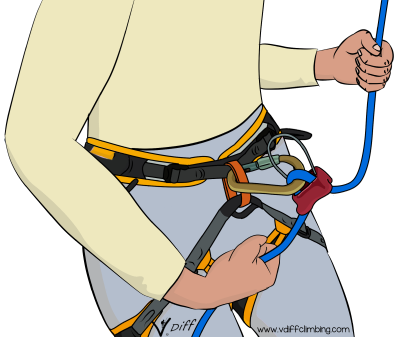 Remember that the climber could fall off without warning, so you have to be ready to catch them at any point. Move your right hand down towards you. 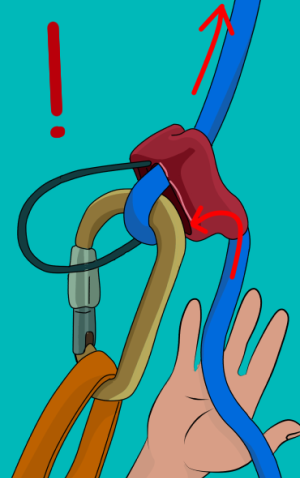 This causes the rope to kink through your belay device, which creates the friction needed to hold a fall. Hold the rope tight. It's important to do this quickly. 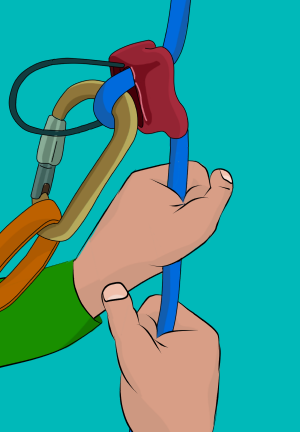 If you are holding the climber for a while, it can be more comfortable to hold the brake rope with both hands. 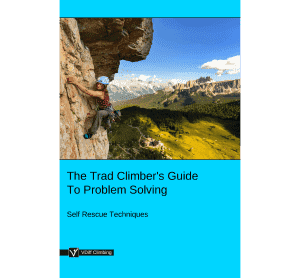 When the climber reaches the top, or has had enough of climbing, you'll need to lower them. Lock off the rope and wait for the climber to put their weight on it. 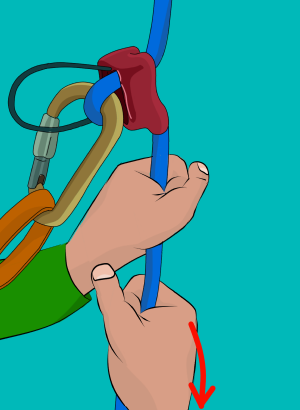 Grasp the rope loosely with your left and keep hold tight with your right, moving your right hand upwards so some rope slides through your left hand and then through the belay device. This will 'lower' the climber a bit. Once your right hand is up against your left, hold on tight with your left to lock off the rope. Then slide your right hand back down. 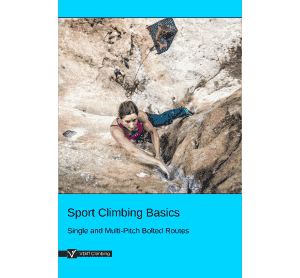 Repeat this over and over until your climber is back down on the ground. 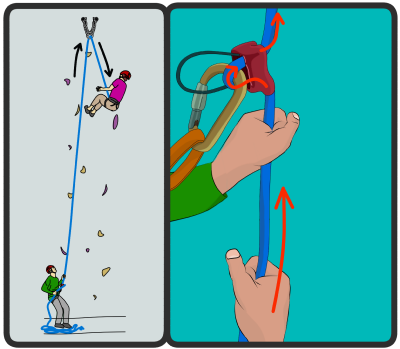 The climber should lean back on the rope, with their feet against the wall in front of them, as if they're sitting in a chair. The climber 'walks' their feet down the wall as they are being lowered. Make sure to lower them slowly and controlled so they don't bash into the wall. Remember: Keep Hold of the Rope! When you belay you need to keep at least one hand on the brake rope all the time. It is this that stops the climber from falling to the ground. Letting go of the brake rope is like letting go of the steering wheel while driving on a fast country road. It's incredibly important that you pay constant attention when belaying and never let go of the brake rope!